Home / lillith sinclair / reviews / videogames / Game Review: "Assassin´s Creed: Rogue"
Game Review: "Assassin´s Creed: Rogue"
Shay Patrick Cormac is hard as gallavanx. I love it. Before I descend into my love for how the Templars in Assassin’s Creed Rogue have evolved, allow me to put forth some general problems I had with the game in question. Gameplay wise, there is nothing new or innovative to speak of. A lot of what you see in this game has been done in previous installments, notably Assassin's Creed III and IV. Ship combat and melee remains virtually the same with no dramatic, awe-inspiring departure from the game universe. At its’ core, Rogue is vastly meat and potatoes and possibly may not induct those looking for an exciting, life-changing experience from Ubisoft’s golden idol of choice. While most of the voice acting in this game is fine, some of the lip synching is incredibly comical and will have you shaking your head in rueful humor if not disdain. Textures will pop in and out at the best and worst of times and there are glitches that can occur in the middle of gameplay that will have you clenching your fists in frustration. Granted, those are few and far in between and are mostly immaterial in the grand scheme of the player experience, but several times I found myself reloading a mission that for some reason did not register completion. Most of the in-game NPC models are dull and don’t express an impressive amount of personality and thus may take away from further immersion of the game. Again, small figs in the jam, but I find that when it comes to half of the criticisms leveled against this game apparently background dramas can incur on player enjoyment and yeah, generally speaking the NPCs are pretty darn daft. This game could have certainly benefited from being made to suit the specifications of the current generation as well from a purely aesthetic point of view. Now, to the central question. Did I personally like this game? DING! DING! DING! I LOVED this game. In my personal opinion, I find this game far more exciting personally than the bigger release of Assassin's Creed Unity (herein reviewed by the Beast itself). Allow me to explain. The story of the trials and tribulations of Shay Cormac is deep, satisfying and incredibly affecting. You see, when a series has concentrated so much on siding with one faction, the other tends to suffer from being plonked in the Bad Guys section because of what so little we know about it and what we are shown. As we know, most of our information comes from open intel available to us at any given time with very little to no insight into the overall picture. Pioneered in III with the delicious Haytham Kenway (call ‘em how I see 'em, that's how I do), Rogue goes further into showing us that Templars are not as horrid and cruel as previous games that have favoured the Assassin’s story would lead you to believe. In fact, due to the influx of insight to The Cross that have been afforded to us, the Templar Order is not unlike that of the Assassin. 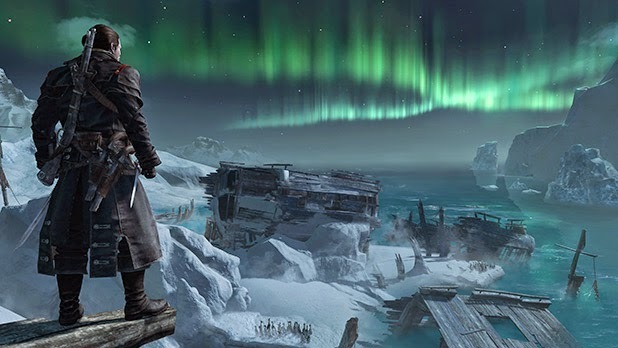 It is on this virtue that Assassin’s Creed Rogue derives a lot of its narrative and character-driven strength. Shay is not an idiot nor is he power-hungry. All he wants is to help the world and when his eyes are opened to the darker methods the Assassin Brotherhood is willing to stoop to in order to obtain its supposed goal of worldwide peace and autonomy, Shay fiercely questions the integrity of his clandestine fraternity and from there, his life takes on a markedly new purpose. The best thing about Shay is that this change of heart from going from Assassin to Templar does not come at the click of the finger; it’s gradual and throughout the game, Shay makes up his own mind about not only what he wants, but what he feels is right. While Haytham is perhaps my number one character from the series thus far, dare I say Shay assumes the admittedly hilarious moniker of Number Two. Care was taken into delivering his story to the player and by the end, despite the dirty deeds that he has committed, the player cannot completely blame him for the course of action he has taken. I delighted in the character and I’m so thankful time was devoted to making him a whole persona rather than a legendary avatar of virtue and vice. Although the story and character of Shay is not the sole reason why this game works, it is definitely a huge deciding factor. Were it not for this plot and the way this character responds, Rogue would have been an empty shell devoid of any true enjoyment. This story isn’t really Paradise Lost, more like Paradise Questioned. What I also applaud it for was for making the Assassins look fallible. They aren’t painted as evil, wicked folks just because the story demands it; the Assassins believe what they are doing is right and when they eventually target Shay, it’s an understandable action. You gotta go big or go home on stuff like this, kids. No half-cocking acceptable. Time to clean house, baby. Considering I enjoyed the heck out of Black Flag, I was enormously thankful for the return to nautical travel in this game. This time, the map includes North American colonies as well as the cold, foreboding North Atlantic with New York returning as the only land-locked locale. Although this world is made up of oceans and islands, there is still so much discover in multiple locations from letters from Templars, hunting animals in order to craft new and useful tools as well as making outfits, treasure maps to uncover valuable secrets and other fascinating quest items. Shay will also find himself becoming a willing agent of death for Assassin Intervention missions of which our man must locate and slay Assassins who are hoping to eliminate a person Shay is charged with protecting. While the same rules will apply for each of these contracts, completion time varies and at the very end of these assignments, Shay will be handsomely rewarded. Apart from an assortment of rewarding collectibles, Shay and his ship, the fittingly named Morrigan, can take down fortresses for the Templar cause as well as go into battle with legendary ships that yield glorious rewards upon defeating them. These legendary ships are tough as nails and never go down without a fight, but there is nothing quite like the victory and accomplishment you feel when you condemn those sentinels to Poseidon's realm. I believe the correct nomenclature is "Boom Shaka-laka!" Although the more discriminant will feel this is more or less a re-tread of previous territory (it is), it still remains a lot of fun if you are willing to put in the time and energy to expose the secrets these worlds offer. Just like the Jackdaw from Black Flag, the Morrigan becomes a character in its own respect in terms of pimping it up and out to be a formidable devil of the waves and there is nothing like some lovely customization to indulge in. It also helps that since the Templars have a broader scope of resources when it comes to firepower and technology that the Morrigan and Shay benefit from having impressive arsenal which not only gets better the more you upgrade it, but makes you feel like a mean mother when you use it. I don't know about you, but I adore being ruthless when the opportunity is afforded to me. Generally speaking, apart from the quibbles I made apparent in the opening of this review, the game still looks great. Some of my favourite locations in this game are the far wilds of the North Atlantic with ships wrecked in ice packs. There is a magic to exploring a forgotten wreck lodged in the clutches of ice, sleet and snow under the light of a gorgeous aurora borealis just as there is also a likewise feeling of majesty while exploring the North American colonies in the lead up to the American Revolution where nature still has a place in the wide world rather than just industry. Upon first playing the game, a lot of my first hours were spent investigating the lands, populated and forbidden, discovering, enjoying and indulging in my need to see this world. I was rewarded for my curiosity and that is what compelled me to continue. In the end, there is nothing truly new about Assassin's Creed Rogue despite several variations. The game doesn't suffer from anything else more or less than its predecessors have, and I would be lying out of my fangs if I told you this game does anything drastically wild and inventive. But. The game does not try its luck by demanding a suspension of common sense or forces itself on the player that they feel alienated. This is a nice slice of life coming from the other side of the same coin which Assassin's Creed III merely hinted at. What lies beneath this game is a fascinating tale of discovery, revelation and finally consequence which will inevitably affect the course of the rest of the franchise. The tale of Shay Patrick Cormac has been told and now you have seen that the lines between the Templars and the Assassins are not so cut and dry and black and white as all of us have been led to believe. Where shall we go from here? We can only speculate, but one thing is for sure, Shay has helped open our eyes.